Tucked away in the rear of Experimenta’s current installation of its International Triennial of Media Art is a modest video installation titled Shoum. Created by Dutch artist, Katarina Zdjelar, the viewer first encounters a blank screen while Tears for Fears’ “Shout” plays on the soundtrack. Hands appear, writing in a notebook, an old iPod player occasionally in shot. The hands, we are told by the didactic panel adjacent to the video screen, belong to two Serbian men who speak no English. They are transcribing the song’s words (“Shout, shout, let it all out”) phonetically: ŚHON ŚHON LAJDI O LAU. The words are not a translation of what is being sung but a new language based instead on a perception of what is being heard. It is an elegant enactment of an idea Jonathan Crary describes in his Techniques of the Observer (1990). Writing of the attempts by philosopher Maine de Biran (1766–1824) “to grasp the density and the immediacy of the ‘sens intim’ [‘inward sense’],” Crary notes that de Biran “began to blur the identity of the very inwardness that was his original object. He employed the term “coenesthesis” [“coenesthesia”] to describe “one’s immediate awareness of the presence of the body in perception” and “the simultaneity of a composite of impressions inhering in different parts of the organism.” In other words, de Biran and others, were coming to see that a new multilayered and temporally dispersed perception made “a soul reduced to pure receptivity” an impossibility. Subjective observation, Crary continues, is not the inspection of an inner space or a theatre of representations. Instead, observation is increasingly exteriorised; the viewing body and its objects begin to constitute a single field on which inside and outside are confounded. Sense, in this sense, is co-constituted. It is from this place that Make Sense as an exhibition mounts its first question. How do we, or can we, make sense of the world? 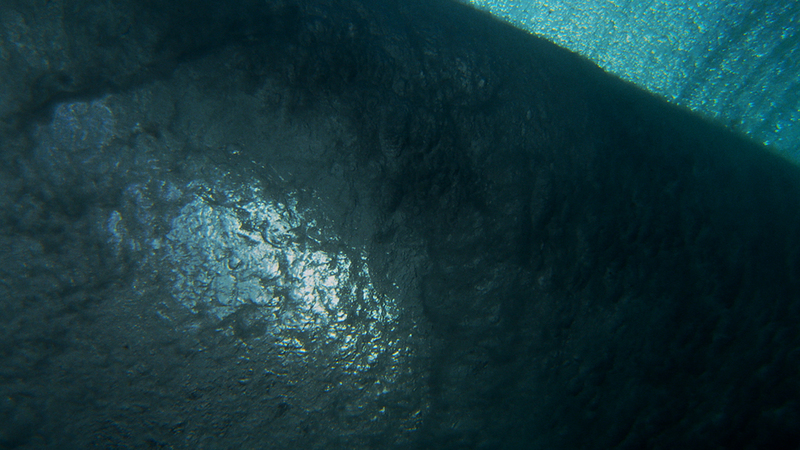 Works like Anna Munster and Michele Barker’s Pull play with our sense of temporality, forcing us to rethink our experiences as they relate to time through our immersion in the instance of the breaking of a wave overhead. One large screen slows down the moment, drawing the experience out over roughly seven minutes. The other screen renders the GPS-tracked movements of the underwater cinematographer as a 3D animation. Both renderings simultaneously resemble and dissemble that moment when a force of nature renders the body mute against it. The work is both sublime and serene. It is also a subtle commentary on the relations between our own inflated human sense of time and the magnitude of geospatial time at a time of ecological crisis. Keith Armstrong’s collaboration with Luke Lickfold and Matthew Davis, Eromocene (Age of Loneliness), takes its title from the work of Harvard biologist EO Wilson who coined the term in his book The Meaning Of Human Existence (2014). Noting that “Earth relates to the universe as the second segment of the left antenna of an aphid sitting on a flower petal in a garden in Teaneck, NJ, for a few hours this afternoon,” Wilson’s view of the fate of humanity as no more or less important than any other species is given life in Eromocene as an ephemeral, chimeric projection in a totally blackened space. The work asks us to consider a world of perception without human perception because humanity has ceased to exist. It is delicate and beautiful and reminiscent of something made from smoke and mirrors. 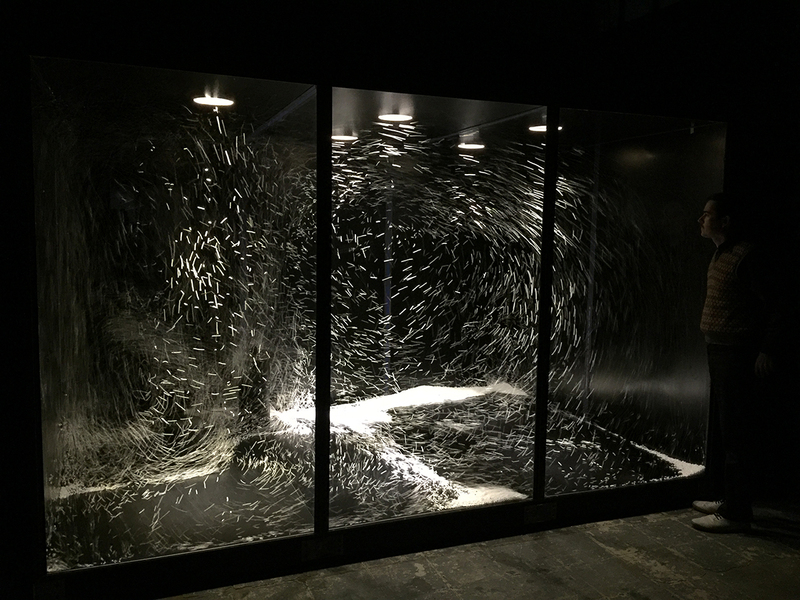 Similarly mesmerising is Scale Free Network’s A Hierarchy of Eddies, an art-science collaboration staged to capture the materiality of turbulence. Small foam balls, like those that endlessly escape from bean bags, are housed in a large glass box. Two fans, placed at different heights from the floor, engage intermittently, sending the balls into the characteristic whorls that make turbulence both an essential but mysterious force in nature from blood flow to tornadoes to the smoke rising from a cigarette. Changing patterns of light capture the movement, rendering it improbably beautiful. Unlike other works in the exhibition, A Hierarchy of Eddies celebrates perception without any consequent demand to make sense of it in the vernacular use of the expression. Other works play less directly with our perceptions and more with perceived norms of communication. In The Thought Leader, Liz Magic Laser takes the now somewhat prosaic form of the ubiquitous TED talk and twists it into a bizarre and menacing visual spectacle. 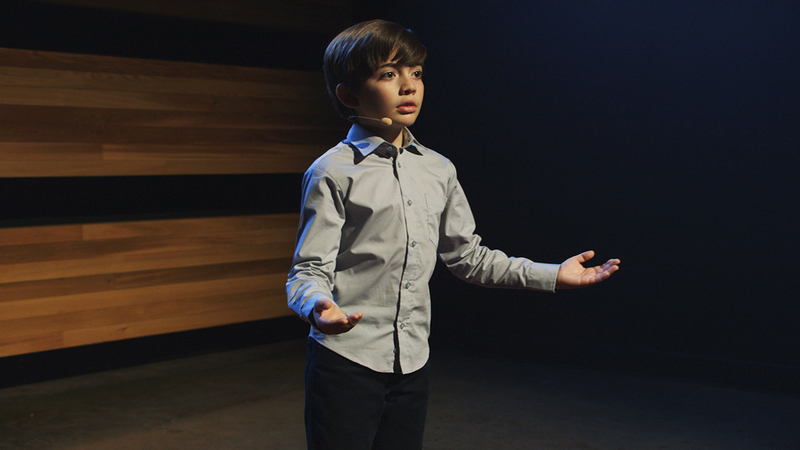 The video features a young boy delivering a monologue adapted from Fyodor Dostoevsky’s novella Notes from the Underground (1864). He delivers his lines with the same idealistic blandness that characterises many such performances while his audience remains quietly hostile and unmoved. Only when he encourages them to poke their tongues out at him do they become animated and the initially child-like gesture grows more and more grotesque. Jane Gauntlett’s In My Shoes: Intimacy takes a similarly familiar technological form and subverts it into an uncanny encounter. Wearing a Samsung Gear VR headset, the viewer is invited into three intimate scenarios — two strangers, two comrades and two lovers — alongside another viewer similarly equipped with a headset. Once inside the virtual space, you encounter the other person as a character who is engaged in a dialogue with the character you are inhabiting. What is surprising is that there is not that much to see. The development of virtual reality has been so heavily invested in visual mimesis that the absence of a sense of visual immersion is disconcerting. The connection to the world is predominantly auditory as you try to follow both the internal commentary of your own character alongside the often awkward interactions they are having with the other person present in the space. Given the confessions of Occular Rift’s creator, Palmer Lucky, that VR is still a long way from being able to craft stories using the technology, Gauntlett’s foray into this space is intriguing. Materialisation is a constant connective theme in the exhibition. In some works, we are reminded of the material basis for our perceptions while in others we are able to see materialised worlds that alter our perceptions. Judy Watson’s two works — The Names of Places and The Keepers — both render visible the repressed and repressive histories of European colonisation. The Names of Places is a web-based work which seeks to collaboratively document the massacres of Aboriginal people following the invasion of this continent. The Keepers documents the artist’s encounter with stolen Aboriginal artifacts now housed in the British Museum. As the camera moves over the objects, the viewer is invited to contemplate what it means for them to be far from their own place and what it would mean for them to be returned. The violence of their removal from an ancient, living and continuous human culture is made stark in the sterility of the images of blue plastic gloved hands moving across them. There are many other works in Make Sense deserving of comment (19 in all) but not time and space to make sense of them all. Experimenta continues to strive to make these kinds of works and ideas accessible and interesting to a wider public. In an age of such austerity, as it relates to arts funding, it’s refreshing to see that some attempt is being made to keep Australia’s rich media arts legacy alive and to showcase artists who help us make sense of what is an increasingly fragile and chaotic world. Lisa Gye teaches media and social impact at Swinburne University. She is also a member of Memefest, an international collective of activists, artists and academics who are interested in socially responsive communication and art.